Very cool people doing very cool letterpress work out of Knoxville, Tennesee. Check them out here>> Its a great way to get your own work out there in great style and unlike many other illustrators. 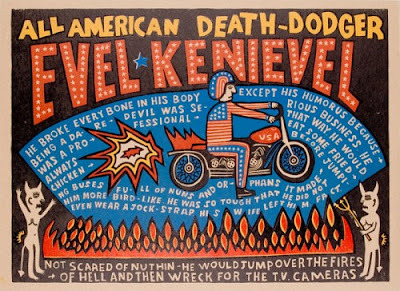 Yee-Haw Industries specializes in original art-like products - from letterpress posters promoting special events, music acts and theatre shows to handmade, woodcut, fine art prints. Our work is custom-to-order, designed, set, and pressed by hand. I love their rough and ready style and sense of type and color. Looks like its been around forever without it being slick and overproduced. The Evil Kneival is a jewel. They were at Merlefest and plans in place for the NY Stationery show.